This is an Easter delight! This darling diaper cake is a precious, pastel design that is perfect for twins! 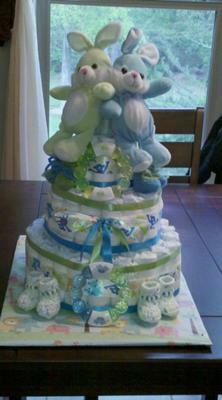 Kate from Louisiana submitted her wonderful, sweet diaper cake along with her instructions and 'recipe'. So glad to add it to our gallery! Thanks so much Kate! I followed the directions provided by this site. I used Pedialite as the center for tiers 1&2, for the third layer I just bundled diapers together. Securing the bunnies on top was the hardest part I used a single rolled diaper and clear rubber bands to secure the bunnies on top; I also had to anchor the single diaper to the middle diaper in the third tier with some white yarn. After that the whole thing was sturdy. I then decorated with ribbon, teething rings, and personally crocheted baby booties. For Easter the mother-to-be will be getting Twin Bunnies, as well as Twin Baby Boys this year!